Last edited by Chad; 10-15-18 at 06:59 PM. 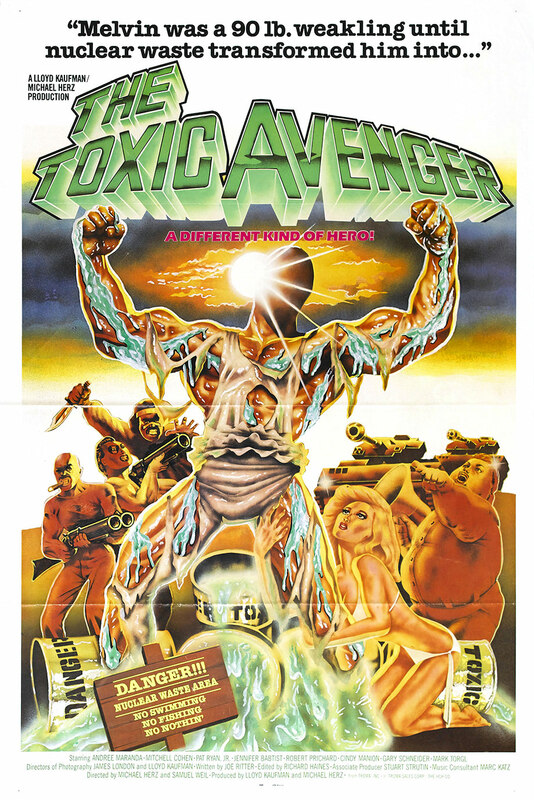 Troma gets a bad rap; with Toxie Avenger the humor is hit or miss but it's a captivating mix of bizarre corny violence. It's brilliant how the hideous monster is the hero who kills the true villain at the end of the movie, hardly an original concept but the Toxie Avenger makes a fun antihero updating Frankenstein for the 80s even if some of the setup is too extreme. The German police officer had me laugh nearly ever time but things like Toxie wearing a tutu just seem like staged eccentricities. The setup is a little overlong and I don't understand the bullies literally running down kids, it seems like they're using violence to justify Toxie's violence later as perhaps less extreme. The character extremes are probably the weakest part of Toxic Avenger, the bad guys aren't just bad they're gleefully ridiculous slipping into what must be parody but to a near constant degree it's an assault on the viewer (even the little old lady runs a slavery operation). 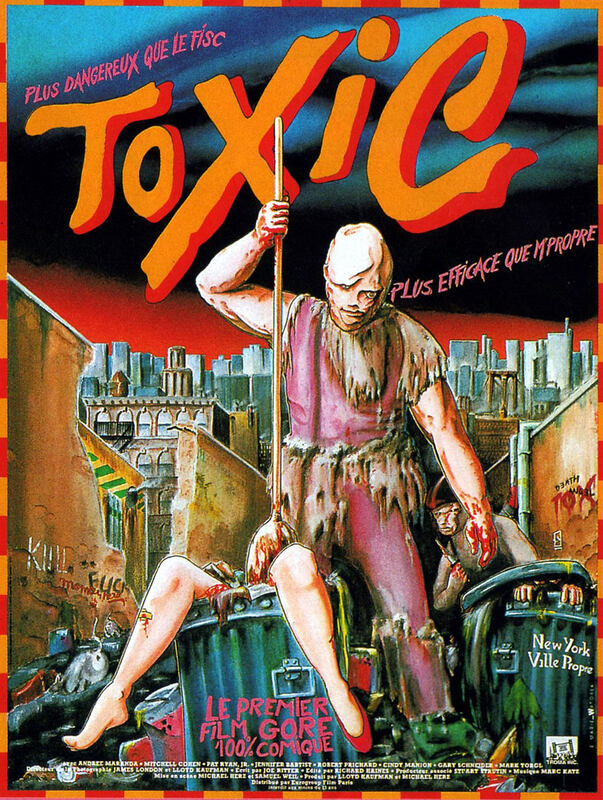 It'll never stop being strange to me some of the movies, like Toxic Avenger, that got cartoon spin-offs. I've tried to introduce my 6 year old to the Killer Tomatoes or Ghostbusters cartoons only to realize how much times must have changed (the kid's more into YouTube, ugh) but I'd be curious to see his reaction to Toxic Avenger. 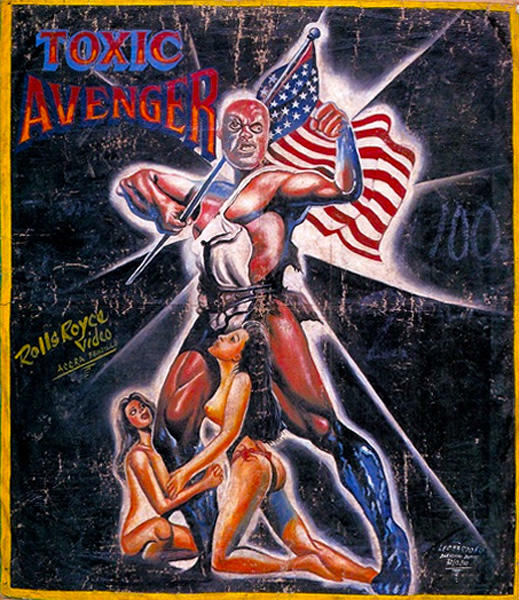 I think Toxic Avenger was the perfect choice for USA Up All Night theme, it nicely captures the campy upbeat sleaze of the series. I thought this was OK which was better than I expected. I've seen a few Troma produced films and usually the kind of humor they have doesn't work for me. I did get a few laughs out of this one, mostly in the first half, and the fights and gore effects were entertaining. I eventually found myself losing interest though. The broadly drawn characters didn't click with me and story wasn't enough to overcome that. This isn't a movie I'd normally choose to watch but it is nice to finally have seen it. Have tried Troma films a few times over the years, and they never do much for me. But decided the theme day and subset choice gave me an excuse to give it another thorough go. Watched the DVD of the original, and even doubled it up with the Lloyd Kaufman commentary. Then straight into the first sequel, thinking that I might keep binging if I was enjoying them. But I think that Troma just isn’t for me. That kinda low-brow humor rarely hits the mark for me, and the gore seems more like gore for the sake of gore than actually useful for the story. Yeah. I think someone earlier in the subset list said "Happy Death Day" was made for teen girls. I feel like Toxic Avenger's sweet spot must be 12-15 year old boys. Not really my brand of humor. But there definitely were moments when it was "so stupid it's funny". The blind girlfriend was funny. Incredibly tacky, but funny. Man the 80s were a special time. I have watched all the Toxic Avenger films and I have tried to enjoy them, but it just isn't my cup of tea. I'll never hear Mussorgsky's "Night On Bald Mountain" the same ever again. This was my first Troma DVD buy many many years ago. I remember really thinking this movie was the greatest, and this disk was stuffed to the gills with extras. It's been over 15 years since then, and this one has not aged well for me. The effects were pretty good, and they really put some money into this movie, but that really didn't help the totality of the cause. This movie is firmly planted in the 80s, and there is no way to look at it other than as a capsule of the times. The acting is purposefully bad, and I just don't have the patience for it now. I still have fun watching this movie. I get that Troma isn't for everyone, so I'd never try to argue the merits the Troma film with anyone who doesn't like one. I was nervous introducing this to a friend, but she enjoyed it and laughed throughout.